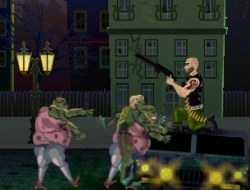 Zombies are a big threat in this game as not many people are still alive after the apocalypse and they have infected most of the population. You are one of the few men standing, but luckily you are a highly trained soldier and you can take them in combat. This is a shooting game and this is what you are good at so get on top of the car as your last point of defense and start blasting them away. They are quite tough as even if you shoot their heads off they can still come and hurt you. Be precise with your aiming and if you see any ammo crates dropping you should shoot them to get a bonus weapon. The ammo on those is limited so use them as well as you can in full combat. Use the mouse to aim and hold the click to shoot. EEville 0.00 between 0 and 10 based on 0 votes.